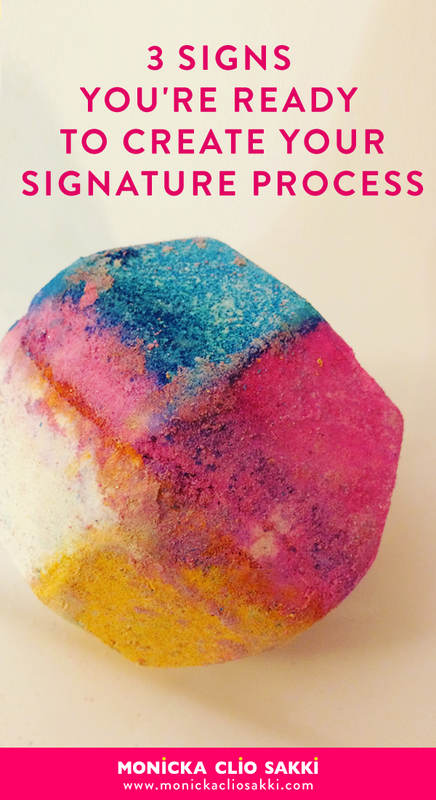 There is a big difference between creating your “Signature Product or Style” and creating your “Signature Process”. When, for example, you doodle, paint, write–you create. You express yourself. You bring something new to life. If you manage to create at a level where your work is unmistakable, then it becomes your Signature Style. If you created a framework that you utilized to create this kind of work, then you have your Signature Process. Creating your own process is like creating your own medicine–something that helps you create in your own way, and helps others create that way too. It’s beyond a manifestation of your self-expression. It’s a tool. A vehicle. A roadmap to additional creation and change. I like using the word “medicine”, because it emphasizes the bigger need and urgency around it. This is not the first color splash on the canvas… or the color combination of your layers. It’s your own medicine AND your signature work. Will you PIN THIS “PILL” PLS?? Creating your own medicine can be a waste of time. When you have a headache, you can take an aspirin. When you get a booboo, you can apply some healing balm. When you feel you need to flex your body, you can practice some timeless yoga asanas, when you are overwhelmed, you can take on a proven system for productivity… and so on. You definitely DON’T NEED to create your own medicine. You don’t need to spend days that will most likely turn into years figuring things out from scratch. You “accidentally” tapped into something. Inspiration came from nowhere, curiosity when least expected, and taking the plunge even more surprisingly so. If that happens, you’ve been served with your initiation call! aka: you got a medicine to make. A medicine that will serve you and others beyond what is already out there. When you craft your own medicine, you are an expert on the “disease”. It’s your own, right? You know how it looks like, how it hurts and where. You know the price of not having it solved. You feel the need. You feel the gap, even if you can’t articulate it. You know the ins and outs of the problem like nobody else. You know the enemy… and you have the deepest desire possible to find a way out, or simply another way. You crave to customize the cure. Tailor it to fit you like a glove. No compromises. No cutting corners. Your innovation muscles are flexing and toning. You can imagine how to bring to life your perfect solution. Best part? No need to copy. If something you need already exists, you might as well use it as-is. Whether you already created it or are about to, when you start following your method, you notice that you drop following others. You are a devotee of your own work. You get the best results and so you believe in it the most. You are not only a satisfied and happy creator, but a user too. Its when you create your signature process, that you can have the biggest impact around you. This exploration and ferocious focus, is what will help you define and bring into being your biggest contribution. You will create your best work yet. Do you feel you have such work in you? Comment and let us know what it’s about. Or contact me directly. I live for these things and I want to support you!